Many companies are grappling with where to place the front-facing cameras on their phones – some use a notch, others a punch-hole, while the Xiaomi Mi Mix 3 opts for a sliding camera. But that’s not the only solution the company is experimenting with, as it has also patented a phone with a camera at the bottom of the screen. Spotted by LetsGoDigital, the patent includes two designs which you can see below, one of which shows a dual-lens camera in a notch at the bottom of the screen, leaving it looking a bit like the phone is upside down, while the other includes a lens in each of the bottom corners. What’s not clear is why either of these designs would be used. After all, they don’t eliminate the notch or make it less noticeable, they just move it. And we’d think that this position could affect the composition of selfies, meaning you’d have to hold the phone at a different angle to what you’re used to. 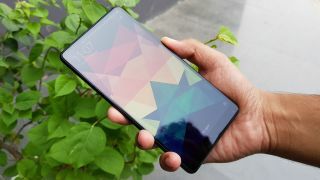 It’s worth noting also that Xiaomi has already put the front camera at the bottom on the likes of the Xiaomi Mi Mix 2 (pictured at the top of this article), albeit in a bezel rather than a notch, and indeed in our review we deemed the placement “aggravating”. So there’s a sense that this patent is different just for the sake of being different, but you never know, Xiaomi may yet have a good reason for the odd camera placement. Of course, many smartphone patents don’t get developed into handsets that you can actually buy, so there’s no guarantee that anything will come of this, especially when the Mi Mix 3’s sliding camera is likely a better option, as it completely eliminates the need for a camera bezel or notch.